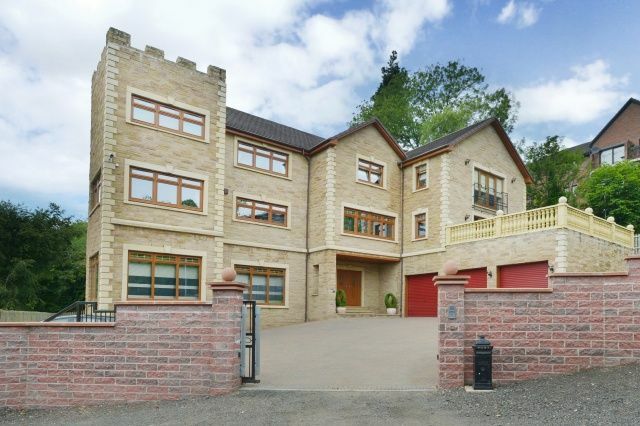 As stunning as it is unique this recently commissioned property has all the hallmarks of clever architectural design.Spread over four floors and encompassing circa 10,500 square feet of luxury living space, 30 Old Mill Road, Bothwell is the premier address within West Central Scotland. Nestled perfectly in a stunning half-acre plot on a quiet cul-de-sac, this walled and gated property is the perfect place to come home to. Within this beautiful home, the ground floor accommodation comprises of a large triple garage/workshop area with electric door entry system. For ease and security the main house can be accessed directly from the garage, allowing the electric gates and electric garage doors to be operated without the occupant leaving the vehicle. The ground floor contains the majority of the extensive leisure facilities within the home. Including a large state of the art home gymnasium for working off the daily cares, a stunning indoor heated swimming pool area including shower area, a laundry room and a very large games room/entertainment suite and snug; containing a pool table and an incredible bar area akin to anything the finest pubs Bothwell has to offer. Following the beautiful central oak staircase leads the viewer to the first floor level, which is equally impressive. The large kitchen, finished in granite worktops, is a chef’s dream and is quite simply breathtaking. There’s a large island unit containing two large four ring gas hobs and a circular extractor fan. There are two Nef self cleaning electric ovens, (one fan assisted), Nef coffee maker and microwave, plus two very welcome warming drawers, perfect for large dinner parties. There is space for a large American style fridge freezer. The up to the minute design means even the taps have instant boiling water. There is both a TV room and breakfast room off the kitchen, meaning mum can keep an eye on everyone as she serves up the family’s favourites. There is also a useful utility room off the kitchen with waste disposal sink and free-standing dishwasher. Also on this level there is an excellent home office/study plus a very spacious lounge, formal dining room, cinema room with projector and a family room leading out to the sun terrace above the garage. The second floor contains six large bedrooms in total, all with stunning en-suite facilities and built-in sliding wardrobes, including the huge master bedroom with en-suite and fabulous dressing area. On the attic level there are a further two large rooms: A playroom and a music room. As expected in this fabulous house full of surprises there is a quirky turreted terrace with stunning views down to the river Clyde and the leafy surroundings of Bothwell. Each floor has its own intercom system, with solid oak doors containing intumescent strips for maximum fire rating and safety. The house is protected by a grade two fire alarm system and a state of the art CCTV security system linked to a central monitoring station. Fully double-glazed and with gas central heating. The large mono-blocked drive offers ample parking for many vehicles. The well maintained gardens are mainly to lawn with Anchor walling providing pleasing terraces of garden space. This is an exceptionally rare opportunity for the prospective purchaser to own a stunning new build property that not only has everything a family home could ever need but is set in one of Scotland's most beautiful and exclusive areas.